Flat in Ponta Negra, 2 suites, 200m from the beach. Building Dune Barcane. The apartment in Barcane Duna offers panoramic views of the South Atlantic Ocean as well as an outdoor pool. 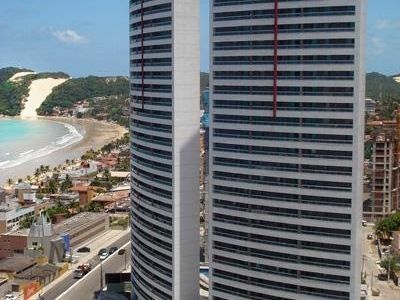 It is situated 200 meters from Ponta Negra beach in Natal. With a convenient location, restaurants, bars and shops are within walking distance. The condo has a complete leisure area with swimming pool, sports court, gym with sea view and sauna. Free private underground parking with security and 24 hour doorman. The apartment is luxuriously equipped with a full kitchen, cable TV, living room and dining. The apartment has 56m2 and can accommodate up to 6 people. It has a suite with double bed and a single guest bed, another suite with a double bed and a suspended single bed and a sofa bed in the lounge. Each suite has air conditioning and private bath. You'll enjoy the wonderful views of the sea and the entire coastal route. Ponta Negra is the most charming beach town, with a trade infrastructure and enviable services, not to mention that, in its streets, you can do everything on foot. And not only that: Ponta Negra has become the most well frequented by young people, families and tourists in search of daytime leisure and a rich nightlife. The apartment has a wonderful sea views of Ponta Negra and prime location, with various facilities (restaurants, currency exchange, car rental agency, cinema, shopping, salon, etc.). For those who like movement may enjoy Stand up paddle, Kitesurfing, Windsurfing, Diving, Surfing, Parasailing, boating, buggy etc. Diving is also available for children can be done with snorkel under the surface or - for the more daring - how about making the Diver Course PADI Professional in Natal? Scuba diving on the high seas until 18m, with possibility of seeing a huge marine fauna with great diversity of fish, turtle, shark, stingray. Come have fun in Christmas! Apartamento bem localizado, bem equipado, camas confortáveis, o Pierre e a Nilma são muito atenciosos... amamos a hospedagem, esperamos voltar em breve. recomendo a todos que desfrutem de dias prazerosos nesse lindo imóvel, o proprietário, sr. Pierre, é muito atencioso, o lugar é ótimo, localização privilegiada, fui muito bem atendido, recomendo a todos, indo a natal aluguem esse imóvel que jamais se arrependerão. Ótima receptividade, ambiente muito acolhedor e excelente localização. toalhas de banho branquinhas. Localização excelente (pertinho de tudo) e com uma vista de tirar o fôlego. Proprietários muito atenciosos e educados. A funcionária Nilma, uma simpatia de pessoa e muito solícita. Só tenho elogios a fazer. Foram 5 dias maravilhosos! Voltarei em breve, com certeza! Apartamento antigo, mas aconchegante, como a casa da gente. Após uma decepção em outra cidade, foi reconfortante chegar lá e estar tudo como o combinado. Pierre super profissional e solícito. O apartamento não é super mega 5 estrelas, mas contém tudo que se necessita pra uma ótima estadia, além de que fica localizado no melhor lugar de Natal, em ponto estratégico, com saída para qualquer direção que se queira ir. Super recomendo. Obrigada Pierre. Apartment high standard with wonderful views of the sea. Only 200 meters from Ponta Negra beach. Prime location, with various facilities (restaurants, currency exchange, car rental, movies, shopping, salon, etc.). The Dune Barcane own pool, gymnasium, sauna, barbecue, private parking. Full kitchen, cable TV, air conditioning and hot water. Internet is available in the mezzanine of the building. Wifi password. Condo equipped gym with the guests' disposal. Ordinance monitored with 24 hour security. This apartment is on the 9th floor of Dune Barcane which is the 1st building of Rota do Sol in Ponta Negra (Av. Engineer Roberto Freire) .tem a suite with double bed and an auxiliary bed, another suite with double bed and a single high bed (sleeps up to 6). Is included bed linen and bath. It has stove, microwave, refrigerator, cookware, dishes, pots and all the basics for light meals. The building has a ground floor shopping with Subway, currency exchange, beauty salon, cafe, bistro, car rental, etc. We are flexible with the schedule. Other Activities: Kitesurfing, Diving, Surfing, Parasailing, Stand Up Paddle, etc. Taxi Driver trusted family available for transfer airport and sightseeing in general. Come to Christmas enjoy its natural beauty and make sure it will be a great experience! If you are looking for a different experience than hotels can offer, you just found the right place to stay. Here you can find quiet assurance, fun and an unforgettable trip. Valores negociáveis em caso de longa duração. Períodos de Feriados (Natal, Ano Novo, Carnaval, etc): preços sob consulta. Em caso de cancelamento, o valor da reserva não será devolvido.